Today’s title comes to you from Nick, who suggested it after he’d been particularly plaguesome and I said I’d had enough of his tomfoolery. “I didn’t have you pegged as a quitter,” he said, forgetting he was dealing with a 3-time college dropout who did not, after all, finish the writing-contest essay (although I did start it). Anyway, I must thank this pesky and flea-bitten, but ultimately gracious beast, who brought me caffeine when I was on the verge of losing consciousness. And I had many medic runs that shift, so lives were probably saved as a result. 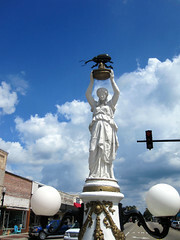 Speaking of vermin, he has actually seen the boll weevil statue I mentioned earlier, and lived to tell about it! He thought I had found this out through some ingenious method of stalking, but I foolishly admitted I hadn’t known he had anything to do with it. I should have kept him in the dark. It would have expedited the taming process. Speaking of vermin and the Conspiracy they bring about, an incautious co-worker brought corn into the dispatch center. Sure, it was adult corn, but you know what it produces when it breeds…Is there by any chance a corn weevil? Speaking of saving lives, the soda machine at Dispatch has the usual sign warning you not to tip it over onto yourself, no matter how much you want to. I noticed there is also a sign on the side of it, “Warning Signs of Suicide.” I would say seeing a co-worker trying to pull the soda machine onto him/herself would be a warning sign. Speaking of warning signs, the sign on the machine had the usual illustration for the illiterate, of a stick figure crushing himself with a soda machine. That guy gets killed as often as Kenny. My hot water heater has a picture of him on fire, running away from the water heater which he foolishly attempted to tip onto himself. Doesn’t he know you should stop, drop, and roll? But my favorite picture of him is on the side door of the bus. He’s leaning back against the door with his arms insolently crossed, and in the next picture he’s fallen out into the street, and no one deserved it more.